So what’s the point of claiming expenses? Well, as a contractor you pay Corporation Tax on your profits each year, so to pay less Corporation Tax, you need to lower your profits. Claiming business expenses does this because they add to your costs, thus lowering profits. Unfortunately, calculating how much to claim on expenses is not as easy as estimating how much you have spent for business purposes. You need to give an accurate figure on your tax return, so you need to keep all of your receipts. You can either keep your records on paper or on computer – if you choose the latter option, you’ll need to scan both sides of any paper receipts (only if both sides are printed on, of course). If you are ever unlucky enough to be investigated by HMRC, you’ll need to show them the records of your expenses to prove that they are all real. What happens if you don’t keep records? Claiming actual business expenses is a legitimate way to lower owed taxes – you’re spending money for your business, which makes its costs higher. But claiming imaginary expenses – ones where you didn’t actually spend the money you say you did – is tax avoidance, so never do it. And if HMRC ever find that you aren’t keeping records and receipts, they’ll think you’re avoiding tax, even if they are legitimate expenses. It’s also worth noting that you’ll need to keep your paperwork for at least the previous five business years. 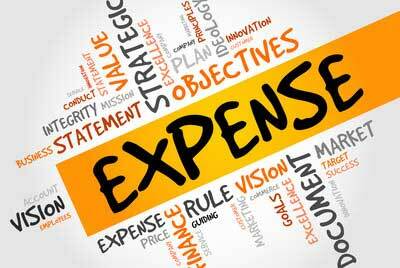 We’ve listed some of the costs you can claim as expenses below. It’s just a quick overview – it’s still a good idea to get the advice of an accountant. EquipmentYou are allowed to claim any equipment as expensive, as long as it is required for an actual contract, either one you are currently working on, or one which you are about to start working on. If it’s equipment you buy for a potential future job, it’s a non-allowable expense. So if you’re an IT contractor looking to buy Photoshop because you think you might be able to get some graphic design work, it’s not an allowable expense. If you need to travel far from home in order to do a job, you’re going to need somewhere to stay, and something to eat. You can claim the costs of the hotel and the food you eat during your working day, but remember that HMRC won’t be too happy if you’re constantly staying in 5-stars hotels. It’s also worth noting that if the job exceeds 24 months, or you know it’s going to exceed more than 24 months, hotels and food becomes a non-allowable expense because it’s seen as your choice to not move closer to the job. Training is similar to buying equipment when it comes to claiming expenses, in that you can only claim for training which is relevant to your current job, and which updates skills you currently have. So if you take on a job which requires a skill you don’t currently have, the training will have to come out of your own pocket. If you have an office separate from you home, any travel between there and your home is a non-allowable expense. However, travel to clients to work on your contractor job is. For you first 10,000 miles per year, you can claim 45p per mile in a car or van, 24p per mile for travel by motorbike, and 20p mile for bicycle travel – make sure you keep records of how much you travel for business purposes.